According to financial guru, Robert Kiyosaki, debts that don’t earn you money are considered as liabilities. Now what about student loans? Obviously, these loans are made so that students can graduate with a degree, get a stable job with benefits, and earn good money. So in a way, student loans shouldn’t be a liability right? 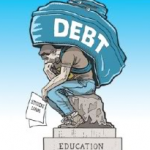 The problem now is, what if your student loan is bigger than your yearly salary? Then you’ll have to end up paying for your student loan long after you graduate. A liability? Sure sounds like it. This is where the question of “how much is too much?” comes into play. There are definitely instances when both students and parents are careless when taking up student loans. 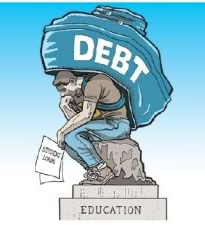 The belief goes like this: “As long as the student can go to a good college, he will be able to pay off the loan anyway when he gets that good job.” The problem with this belief is, there’s a lot left to speculation. So how can we ensure that the loan amount we get can be realistically paid off within the first few years on the job? Well, there’s really no insurance. But there is a recommended amount that your student loan would be better off not exceeding. Finaid.org reports that the average student loan in 2008 was $23,000. Aside from that, Sallie Mae also reports that students usually have a credit card debt of about $4,000. That amounts to $27,000 which most students cannot earn during their first year of working. It’s advised not to go over the maximum amount permitted under the Stafford loan program, which incidentally is also $27,000. Also, it’s best to remember that if there really is no need to take on a loan that goes up to the maximum, it’s much better not to. If you can take on a loan that is less than that, then, the better. It is also advised that the amount of student loan taken should not exceed the projected salary of the student during his first year of working. Now that the figures have been laid on the table, it’s easier to realize whether that less expensive school would be a better option. Although expensive education can give more quality, it also pays to be realistic.